A low fat great tasting breakfast. In a large bowl mix flour, salt, baking powder and sugar. Stir in skim milk and bananas. Spray a pre-heated griddle or frying pan with non-fat cooking spray. 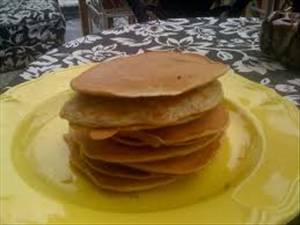 Cook pancakes using approximately 1/4 cup of batter per pancake. Love this recipe and try it for the first time tonight. Tasty cauliflower and asparagus soup. There are 177 calories in 1 serving of Banana Pancakes II. Calorie break-down: 4% fat, 81% carbs, 15% protein.